The fate of Captain Francesco Schettino of the doomed Costa Concordia cruise ship seems more and more certain with each new piece of evidence is released by the Italian prosecutors. 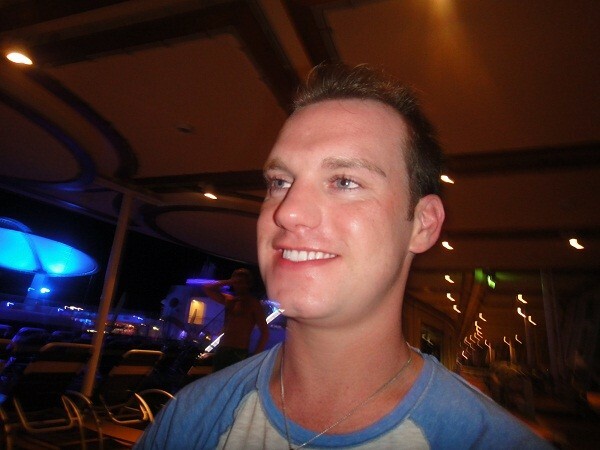 Cruise Ship Lawyers Blog has covered this incident from the beginning. At first, it was confirmed that Captain Schettino abandoned his ship before all cruise passengers were rescued and safe. Then, the investigators revealed that the Captain delayed the evacuation of the ship and caused the disappearance of more than three dozens of passengers. The black box of the Costa Concordia was recovered not long after the tragedy took place and members of the public are now being shown what happened on the bridge of the ship as tragedy occurred. Tagged: "Black Box", "Costa Concordia", "Costa Cruise Lines" and "Francesco Schettino"
One hundred days have passed since the tragic events of the Costa Concordia which saw the confirmed death of 30 cruise passengers and the disappearance of 2 additional passengers whose bodies have yet to be found. It took more than 100 days for the cruise industry to agree on three new safety measures. The announcement of the new policies by the cruise industry through Cruise Lines International Association (CLIA) and the European Cruise Council (ECC) is all over the print and digital media and looks more to be a public relations coup than addressing the true concerns and lessons that were learned from the events that led to the sinking and grounding of the Costa Concordia. 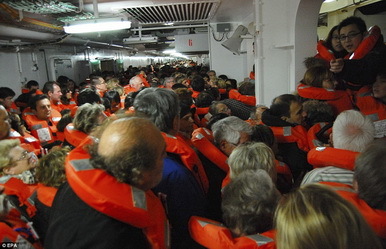 The first measure proclaims that cruise ships will now have more lifejackets aboard than are required by law; Limiting access to a ship’s bridge at potentially dangerous times; and requiring cruise ship routes to be planned in advance and shared with all members of the bridge team. The second and third measures are directly addressing errors which may have contributed to the Costa Concordia’s demise. Last January, Captain Schettino had invited a female passenger to the ship’s bridge, which according to witnesses, distracted not only the Captain, but the rest of the bridge team. One should wonder why it took over 100 days for the cruise industry to figure out that bringing passengers to the bridge of a ship when the captain and the bridge team are maneuvering the ship is a terrible idea. The third measure is equally baffling. Why did it take until April of 2012 to require a bridge team to agree the ship’s route before the ship sails and stick to the route? What has happened to common sense? In a previous article, we have listed the reasons why the Costa Concordia cruise passengers will have a strong legal argument to lift the cruise company’s limits of liability under the Athens Convention. The language contained in the Convention allow the cruise liner to limit is financial liability to a maximum of $72,000 per passenger affected by this tragedy for their personal injury or death. However, Article 13 of the Athens Convention does provide that if a passenger is able to prove that their damage resulted from an act or omission done [ . . . ] recklessly and with the knowledge that such damage would probably result, then the limits of liability of the Athens Convention would not apply. The latest information coming out of the office of Italian prosecutor Francesco Verusio is the most damning evidence of recklessness yet on the part of Captain Schettino. In a new audio recording released Thursday, Captain Francesco Schettino is heard communicating with Livorno port authorities after the ship had hit a reef and before the ship began capsizing. In the exchange, a port authority officer tells Schettino that they have heard from a crew member that there had been a major incident during dinner and that plates and glasses had slammed onto passengers. Schettino was quick to reassure the officer that everything on board was fine and replied that the incident in question was caused by an electrical blackout and that the crew is “verifying the conditions on board“. Captain Schettino failed to mention that the ship had hit a reef. New accounts by crew members are beginning to surface six days after the incident. French stewart Thibault Francois told French Television that the captain sounded the alarm too late and did not order or instruct the crew to evacuate the ship until it was too late and the ship had already begun listing on its side and taken in a substantial amount of water. Eventually, crew members started lowering lifeboats on their own. Francois said “the captain asked us to make announcements to say that it was electrical problems and that our technicians were working on it and to not panic”. “There were no orders from the management,” he added. Another crew member, Mukesh Kumar who was one of the many ship’s waiter said that “the emergency alarm was sounded very late,” only after the ship “started tilting and water started seeping” in. “The ship shook for a while, and then the crockery stated falling all over,” said Indian Kandari Surjan Singh, who worked in the ship’s galley. “People started panicking. Then the captain ordered that everything is under control and said it was a normal electric fault … so people calmed down after that.” As reported by the Associated Press. 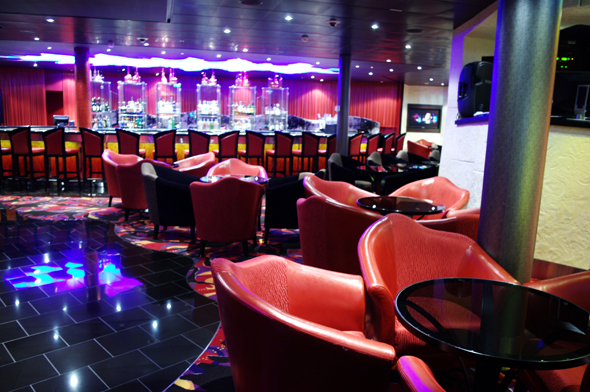 For additional information about cruise ship litigation and cruise ship law, visit Leesfield Scolaro’ Cruise Ship Law Center. It now sounds that Captain Francesco Schettino attempted to minimize the incident telling the Livorno port authority that the incident was only a blackout and nothing else. He intentionally omitted to advise that the ship had hit a reef. That fact alone unquestionably resulted in the coastal rescue efforts to be delayed by at least 40 minutes. The ship hit the reef at approximately 9:30 p.m. and it is not until 10:10 p.m. that the “Abandon Ship” signal was sounded. An Italian Judge will have to decide whether lives could have been saved had the port authority been told by Captain Schettino the true nature and potential extent of the seriousness of the incident. The judge will also have to decide whether Captain Schettino was reckless in announcing to passengers that the incident in question was only an electrical issue and that everything was under control. As a result, the evacuation was also delayed until it was clear that the ship was taking water and began capsizing. In another sad news, the search and rescue efforts found four additional bodies in the wreckage of the ship. The number of fatalities rose to 15. There are still 17 people who remain unaccounted for, including 2 Americans, Barbara Heil and Gerald Heil. Captain Schettino remains under house arrest. He faces up to 15 years in jail if found guilty on charges of manslaughter and abandoning his ship. Tagged: "Barbara Heil", "Carnival Cruise Lines", "Costa Concordia", "Cruise Ship Disaster", "Francesco Schettino", "Gerald Heil", "Micky Arison", "Passenger Disappearance" and "Passenger Rights"
What are Costa Concordia Cruise Passengers’ Rights under the Athens Convention? The Athens Convention establishes a comprehensive integrated system to govern the liability of cruise ship operators for personal injuries and property damage sustained by its passengers. It contains standards for establishing liability and permissible defenses as well as its own statute of limitations and venue provisions. The Convention was primarily motivated by a series of uninsured ferry disasters occurring in a number of underdeveloped countries. Amid the Costa Concordia tragedy, it seems very likely that cruise passengers will have to file any lawsuits in Genoa, Italy, where the cases will be subject to Italian law. Courts in the United States have consistently upheld the choice of law clauses contained in cruise passenger tickets absent evidence that “enforcement would be unreasonable and unjust”, ” the clause was invalid for such reasons as fraud or overreaching”, or “the enforcement would contravene a strong public policy of the forum in which the suit is brought”. More importantly, as part of this comprehensive system, the Athens Convention allows the carrier to limit its liability for passenger personal injury or death in the absence of its reckless misconduct. The current monetary limitation in U.S. dollar is approximately $72,000. The operative words are “in the absence of [the carrier’s] reckless misconduct.” Specifically, Article 13 of the Athens Convention provides that the carrier will lose its right to limit liability where it is proven that the damage resulted from an act or omission done with intent to cause damage or recklessly and with the knowledge that such damage would probably result. 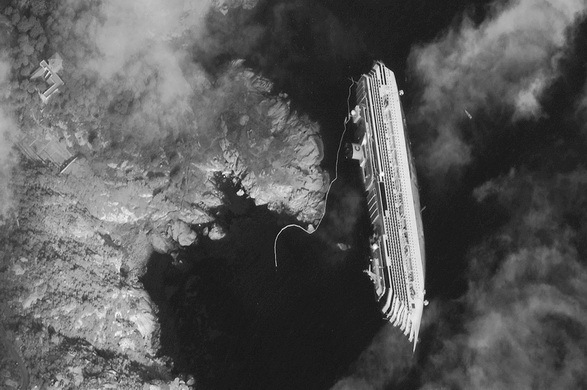 Can Costa Concordia Passengers prove that the carrier acted recklessly and with knowledge that damage would probably result and lift the carrier’s right to limit its liability? According to court documents filed today in Italy, Captain Francesco Schettino admitted to a judge that he made a mistake in steering the ship too close to the Island of Giglio. Captain Schettino deviated from the ship’s programmed route and came 0.28 nautical miles (less than 600 yards) from the coast. Head waiter, Antonello Tievolli, reportedly did not ask the captain to steer towards his native island, but he nonetheless told his family that he would be passing by that evening and his sister, Patrizia Tievoli, shared his whereabouts on her Facebook profile by posting the following wall post: “In a short period of time the Concordia ship will pass very close. A big greeting to my brother who finally get to have a holiday on landing in Savona”. According to an audio recording, which is now part of the prosecutor’s case against Captain Schettino who is currently under house arrest and facing criminal charges for manslaughter and for abandoning ship, it is established that the ship’s captain did leave the cruise liner before all passengers were evacuated and ashore. Pier Luigi Foschi, chairman of Carnival’s Italian unit, Costa Crociere confirmed at a press conference in Genoa on January 16, that the Costa Concordia ran aground at about 9:45 p.m. on January 13, within hours of leaving a port near Rome to continue a Mediterranean cruise. The ship’s route was set electronically before it left, and the cruise liner should not have been so close to Giglio Island. Foshi added “the fact that the ship strayed from that course can only be due to a maneuver that was not approved, not authorized nor communicated to Costa Crociere by the captain of the ship”. It has now surfaced that it was common practice for the Costa Concordia to deviate from its original route and to sail dangerously close to Giglio Island. An amateur video footage was recently posted online showing the Costa Concordia sailing off the coast of the island, closer to the shore in August 2011 than it did on January 13. 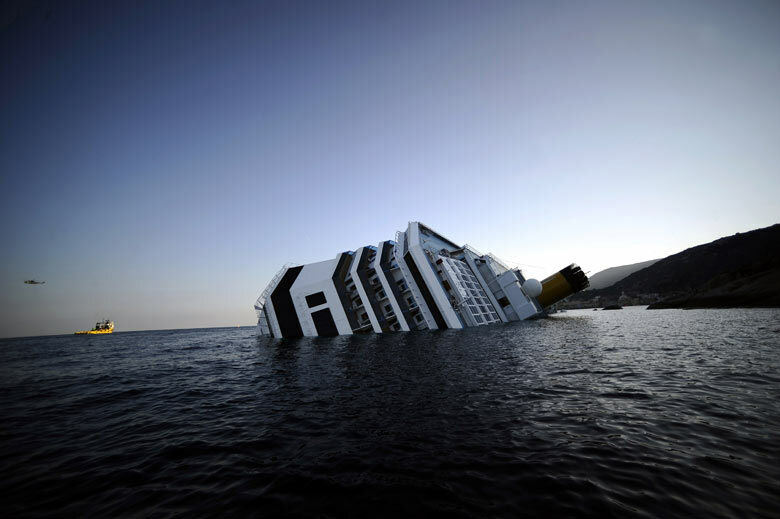 In a recent interview to the media, Italian Prosecutor Francesco Verusio declared that “the unscrupulousness of this reckless maneuver that the commander of the Costa Concordia made near the Island of Giglio is something that is inexcusable. From the investigation we carried out straight off the incident, we are certain that the captain of the ship was on the command bridge and the control of the ship was in his hands. This risky maneuver that the captain performed sailing close to Giglio Island without due caution caused the impact that we all saw. The captain is in a very difficult position because we are sure that he abandoned the ship when many passengers were still waiting to be evacuated”. Captain Schettino: It’s Capt. Schettino. Port Authority: Speak in a loud voice. Port Authority: Speak in a loud voice! Put your hand by the microphone to cover it and speak up! Is that clear? Port Authority: I understand that. Listen to me, there are people that are getting off using the rope ladder on the stern side, you go back there and you go up that ladder the opposite way, you go onboard the ship and you tell me how many people [are there.] And what they need. You tell me if there are children, women or people that need assistance and you give me a number for each one of these categories is that clear? Port Authority: There are no “pleases!” Get back on board! Please assure me that you are going back on board. Port Authority: What are you doing captain? Port Authority: Do you refuse to do that? Port Authority: Are you refusing to back on board? Port Authority: Get back on board! This is an order! You don’t need to make any other assessment. You have declared that you have abandoned ship, therefore I’m in command. Get back on board right now is that clear? Port Authority: Can you not hear me? Port Authority: Then go! And call me right away when you are on board. There’s my rescuer there. Port Authority: My rescuer is on the stern side, go! There are already bodies, Schettino! Go! Tagged: "Barbara Heil", "Carnival Cruise Lines", "Costa Concordia", "Cruise Ship Disaster", "Francesco Schettino", "Gerald Heil", "Isola del Giglio", "Missing Americans", "Passenger Disappearance" and "Passenger Rights"
The disaster that shook the passengers of the Costa Concordia when the ship ran aground and capsized near the Island of Giglio, Italy, while probably the most tragic in recent memory, was not the first tragedy of its kind. In 1998, the Monarch of the Seas had an eerily similar incident, which, thankfully for the thousands of passengers on board, did not result in the loss of a single life. 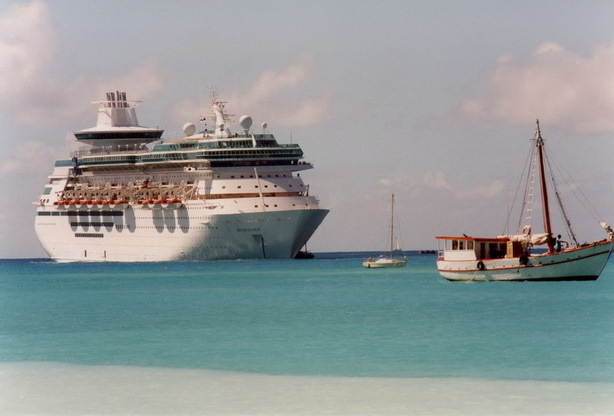 On December 15, 1998, the cruise ship, Monarch of the Seas, operated by Miami based cruise company Royal Caribbean Cruises, was in the Bahamas, en route from St Thomas, U.S. Virgin Islands to Martinique. The ship had purposely deviated from its intended course in order to sail into St. Marteen to disembark a sick passenger who needed immediate hospitalization. While the vessel awaited the return of the vessel’s crew, the ship drifted freely on an easterly heading. At about 1:25 a.m., the doctor and nurse returned to the vessel. The ship’s master himself then piloted the ship to starboard from an easterly course heading, steadied the vessel up and set a departure course of 160 degrees true to pass east of a marked reef known as the Proselyte reef. This course was based largely on the master’s mariner eye as well as on the Officer of the Watch’s feedback that the Automatic Radar Plotting Aid’s calculated Closest Point of Approach to the Proselyte reef lighted buoy on the 160-degree course. The master felt that this course provided the vessel a safe passage to the east of Proselyte reef as well as would allow a safe passage astern of an outbound sailboat that was just to the south and ahead of the Monarch of the Seas in the vicinity of the Proselyte Reef lighted buoy. Unfortunately, the course of 160 degrees was established without first sufficiently determining the initial position of the vessel. Further, no track line for the 160-degree course was laid down or marked on the navigational chart in use at the time nor was the 160-degree course part of the voyage plan from St. Maarten to Martinique. Additionally, the ship’s chart used at the time of the grounding, was not updated with respect to an updated position of the lighted buoy on proselyte Reef. Three minutes later, at approximately 1:30 a.m., the Monarch of the Seas raked the Proselyte Reef at an approximate speed of about 12 knots without becoming permanently stranded. Almost immediately emergency and abandon ship signals were sounded and the crew and passengers were mustered at their abandon ship stations. To learn more about the events described above, read the Joint Report of Investigation into the Circumstances surrounding the grounding of the Monarch of the Seas. At 2:35 a.m., the vessel was intentionally grounded on a sandbar in Great Bay, St. Maarten. The evacuation of passengers and crew began immediately and by 5:15 a.m., all 2,557 passengers were safely evacuated ashore by shore based tender vessels. (1) Accurately determine the position of their ship in relation to a known reef area. (2) To navigate their ship in a manner which would give wide berth to such a hazard. The investigation on the Costa Concordia disaster is still in its early stages, and yet an enormous amount of information and reliable evidence has already surfaced. It seems established that the ship deviated from its original course. Unlike the ship’s master of the Monarch of the Seas, Captain Francesco Schettino’s deviation was intentional and not necessary. Read this article to find out why Captain Schettino sailed so close to the Island of Giglio. Tagged: "Barbara Heil", "Costa Concordia", "Crew Member", "Cruise Ship Disaster", "Cruise Ship Lifeboat", "Francesco Schettino", "Gerald Heil", "Intentional Grounding", "Isola del Giglio", "Monarch of the Seas" and "Royal Caribbean Cruises"
While investigators are looking at the black box of the cruise ship Costa Concordia that sunk off the coast of Italy, prosecutors did not waste time in gathering facts and evidence from passengers and crew members, which have led them to arrest Captain Francesco Schettino on allegations of manslaughter and for abandoning ship. Why did the ship capsize? Italian Prosecutors with the help of Costa Crociere executives have released that, for some unknown reason, the ship deviated from its original route. While en route from Civitavecchia to Savona in Northern Italy, the ship veered off its course and navigated much too close to the coast. Within 300 meters off the coast, the ship collided with a large underwater rocky formation which perforated the hull causing significant damage and which started the capsizing of the ship. In shallow waters, the wash from the cruise ship close to shoreline had nowhere to go and may have rebounded on the hull causing the ship to roll and capsize. On Monday, Pier Luigi Foschi, CEO of Costa Crociere, the company that owns the Costa Concordia luxury cruise liner, said Captain Schettino made an unauthorized deviation from the programmed course, a “human error” that caused the ship to hit rocks near the port area of Giglio and capsize late Friday. A report from CTV News. Since that statement was made, Carnival Cruise Lines, owner of the Costa Concordia has disassociated itself from the captain’s behavior. Carnival Cruise Lines is the largest cruise line company in the world and is based out of Miami, Florida. According to several accounts from evacuated passengers, and as was confirmed by prosecutors, evidence is mounting that the ship’s captain was evacuated ashore, safe and sound, hours before hundreds of passengers even made it to a lifeboat.